In this exclusive interview on the eve of Christmas, Bishop William Shomali, the Palestinian-born auxiliary bishop of the Latin Patriarchate in Jerusalem, said he agrees with Rabbi David Rosen that Pope Francis should make a new initiative for peace as “the new vicious wave of violence” that started on Oct. 1 is sweeping through Jerusalem and the Holy Land causing more deaths, more hatred, more distrust and fear, as well as acts of retaliation between Israelis and Palestinians. He told me he fears the violence will escalate but hopes against hope for it to stop and for “serious negotiations” to begin with a view to a final settlement of the more than 60-year-old conflict. In this Jubilee Year of Mercy, he appeals to the Catholic Church throughout the world to take action for peace and to help the Christians in the Holy Land by coming on pilgrimage. How would you describe the situation in the Holy Land today? What’s it like in Jerusalem where you are living? Since Oct. 1, the Holy Land entered a new vicious cycle of violence. It is painful to watch terror and violence taking over Jerusalem, particularly along the Via Dolorosa where Jesus suffered to dissuade the use of violence. All this contradicts Jerusalem's vocation as a Holy City. Daily protests by young Palestinians happen near checkpoints. Israeli soldiers respond with live and rubber-coated bullets and also tear-gas canisters. Stabbing and shooting incidents have become our daily bread. Funerals follow every killing, turning into an occasion for retaliation. These actions generate more hatred, more distrust, more fear and acts of vengeance. A media war accompanies this struggle as one side tries to convince the world that its cause is right and due to the savagery of the other. Netanyahu and Abbas accuse each other. Netanyahu says: "It is time that President Abbas stops not only justifying it but also instigating it,” while Abbas criticizes Netanyahu for the ongoing disproportionate use of force and punitive actions such as demolition of houses, revocation of residency status and air-raids on Gaza, killing innocent people asleep in their homes. While the Israeli leadership attributes the escalation in violence to Palestinian incitement, most Palestinians point to the decades long Israeli military occupation as the root cause of recent events. What has caused this downturn in the situation? We seem to be witnessing a combination of two unrelated factors. First and foremost is the failure of a long-known “peace process.” For many years, Palestinians, youth included, had given Mahmoud Abbas a free hand to work through diplomacy; that is, using the international community as leverage to compel Israel to end the occupation. Ten years later, we still see ourselves back at square one. Regretfully, Israel has ably used this time for an extensive expansion of settlement activity throughout the West Bank and also to complete the separation of East Jerusalem from its Palestinian backyard. The other factor is the daily visit of settlers and some Israeli politicians to the courtyards of the Al-Aqsa Mosque and Haram al-Sharif. Today, the Al-Aqsa Mosque and the Dome of the Rock stand on the spot of third holiest site for Muslims; they believe that from there the prophet Muhammad ascended to heaven. However, this site is also revered as the holiest area in Judaism, the place where the two Jewish biblical temples stood. Jews believe Abraham was called upon by God to sacrifice his son Isaac here. The new wave of violence is taking place in the wake of rumors that Israel plans to change the established Status Quo and take over the entire compound—a charge the Israeli government denies. Tensions have been fueled by the continuing visits of ultra-religious Jews attempting to pray at the site. Muslims are afraid of a time-sharing of the compound, if not in terms of space, because of what happened in the Patriarchs’ Tombs in Hebron after 1967. What are your fears and what are your hopes in this situation? Our fears are: more escalation of violence, more victims and more hatred between the two peoples, less employment and fewer chances for resumption of negotiations. We fear also that more Christians will leave the Holy Land, looking for a better future for their children and for themselves. We hope that this wave of violence stops and more serious negotiations take place in view of a final settlement. What are the churches in the Holy Land doing to prevent violence, to foster reconciliation and peace in this situation? Being the voice of truth: This means condemning evil wherever it originates. The bishops of the Holy Land condemned the arson in Tabgha committed by Jews, and the torching of Joseph’s Tomb in Nablus done by Palestinians. The bishops raised their voice and went to court against the separation wall that is planned to separate 58 Christian families from their land. The truth is: occupation is the root cause of the problem. Any negotiation should not question the principle of withdrawal but the modality of its implementation and its chronological path. Are the religious leaders—Jewish, Christian and Muslim—in Jerusalem and the Holy Land doing anything together to prevent the violence and find a peaceful solution to the Israeli-Palestinian conflict? The rare meetings that take place are helpful but not enough. I remember that one week after the Gaza war representatives of all the religions in Israel met and published a statement calling both parts to stop violence. Nevertheless the war continued for six weeks more. I have to mention also that during the first weeks of the last wave of violence the Grand Rabbinate published a statement prohibiting Jews from visiting Al-Aqsa. This statement helped to decrease violence around Al-Aqsa but not in Israel and the Palestinian territories. When fire starts, it is not easy to extinguish it. Rabbi David Rosen thinks Pope Francis should make a new initiative for peace in the Holy Land, by bringing representatives of the different religions together, and coordinating all this with the political leadership on both sides. What do you think of his proposal or what would you like to see happen? Pope Francis has a great concern for peace between Israelis and Palestinians. In the wake of his last pilgrimage to the Holy Land in 2014, he invited the Israeli and the Palestinian presidents, together with representatives of the three religions, to the Vatican to pray together and to plant an olive tree as a symbol of peace. For some this meeting seemed to be a failure, but it is not fair to think like this. Such an action, accompanied by genuine prayer, may produce fruits much later, as the image of the olive tree, planted in the same occasion, reminds us that it may produce the first fruits after five years. It is never too late to have peace. I appreciate the trust that Rabbi David Rosen has in Pope Francis, a trust increased by the fact that Pope Francis succeeded in making reconciliation between Cuba and the U.S.A. after 50 years of hostility. I support the idea that Pope Francis convenes again the different religious leaders, not only to pray but to make a brainstorming about the possibilities of peace. As religion is part of the problem in the Holy Land, it should be part of the solution. I say this without forgetting all the inherent difficulties given that the nature of the problem between both sides is ideological and not only political. In fact, there are two opposing narratives, two different versions of geography and history, and two ways of explaining the same conflict. If there are two ways of looking at the same conflict, there are also two opposed ways of looking at the solution. This makes any discussion more difficult. But we know that it is worth to try, putting the trust in the Lord, who is the first protagonist of history and master of the impossible, who can “fill in the valleys, and level the mountains and hills, straighten the curves, and smooth out the rough places” (Is 40:4). Through which door could peace come, given the vicious circle of hatred, ignorance and mutual misunderstanding? The solution is the implementation of Security Council resolutions 242 and 338 and the establishment of a Palestinian state according to the 1967 borders as recognized by the U.N. decision last November. International legitimacy may be the only strong and solid platform for future negotiations. The Holy See recognized Palestine as a state in a very courageous move in May 2015. We remind Mr. Obama of his promise during a short visit to Cairo: “America will not turn our backs on the legitimate Palestinian aspiration for dignity, opportunity and a state of their own.” At the same time we know that with every day that passes this solution becomes less viable because it is hindered by the increasing numbers of settlements in the West Bank. 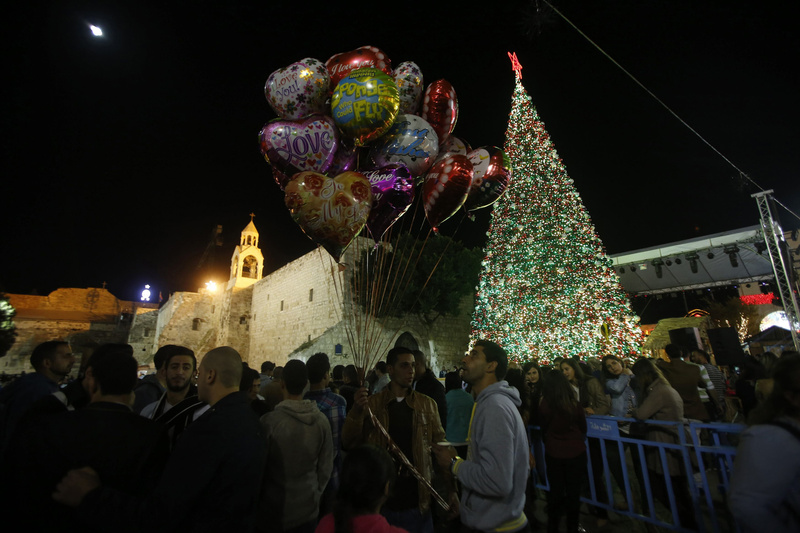 Soon it will be Christmas, but what kind of Christmas will it be for Palestinian Christians in Israel, in the West Bank and in Gaza? Despite the wave of violence and the invitation of some Christian leaders to abolish the external Christmas festivals like the lighting of Christmas tree, this year is a special one. The number of Christmas trees lightened was higher than ever, in the presence of ministers and the governor of each district. Even in cities like Naplouse where 98 percent are Muslims, the Christmas tree was lit in the middle of the city and in presence of the Muslim mayor and the Muslim governor. This year also, thousands of Christians obtained permits to visit Jerusalem. The same happened in the villages and cities in Israel, where there is a consistent number of Christians. It seems that the more there is unrest, the more people feel the need to celebrate and to forget for a period their daily troubles. However, it should also be said that there was moderation in the degree of festivities in some places, like in Ramallah. Fireworks were avoided as a sign of solidarity with the victims of violence. Will Palestinian Christians living in Israel be able to go to Bethlehem to pray at the Grotto of the Nativity there? Yes. They will be allowed like every year. Do Christians continue to emigrate from the Holy Land? During the five years of the second Intifada, 5,000 Christians emigrated from Bethlehem, mainly to the U.S.A. But in the last 10 years, less than 1,500 people left. The most significant decrease in emigration is witnessed in Gaza. The few Christians who remain there prefer to live in the West Bank. It is not allowed, but they take advantage of the permits they receive for feasts to remain in the Bethlehem area. Christians have lost their legal battle to prevent the building of the wall in the Cremisan valley. What are the consequences of this? There is a general frustration especially in the hearts of the families that will lose their land behind the wall. They have lost their trust in the Israeli courts since the decision against their appeal was taken on a political level and not on legal grounds. Pope Francis has opened the Jubilee Year of Mercy and the Holy Door first in Bangui, the war torn capital of the Central African Republic, and then in Rome. What is the Latin Patriarchate in Jerusalem and the Holy Land doing for this year of mercy? Has it opened Holy Doors and, if so, where? Because of the many rites and of the political divisions of the diocese, there will be more than eight Holy Doors in the different dioceses of the Holy Land this year. These doors were or are still to be opened in cities like Jerusalem, Bethlehem, Nazareth, Haifa and Amman. During this Jubilee year, our main activities are to educate and help people to experience the mercy of the God in their life, and especially in the confessional, which Patriarch Twal called “the real door of mercy.” We also invite families and couples to seek reconciliation and forgiveness. We called every believer to practice the spiritual and corporal deeds of mercy. For this reason we made a program for the whole year, with the support of posters and some prayers ad hoc. How or in what ways can the theme of mercy be lived out in the present situation in Jerusalem and the Holy Land? What applies to other parts of the world applies to us, but we have to add the interreligious dimension. In this multicultural and multi-religious land we must include Muslims and Jews in our actions of mercy. The measure of mercy is to live it without measure. This will make a difference in their life and in our life. Christians should avoid the mentality of ghetto whereby charity stops at the borders of our own parish or my own family. Are many pilgrims coming to the Holy Land? The pilgrims coming now are only 30 percent of those who used to come in the same period last year. What can the Vatican or the worldwide Catholic Church do to help the Christians in the Holy Land? Many of our institutions continue to do marvelous work thanks to the effective support of the Catholic Church dioceses throughout the world. We feel most grateful to them and to the Holy See for their spiritual and material support. Here I have to mention in a particular way the Order of the Holy Sepulcher of Jerusalem for its direct support to schools and for the charitable and pastoral work of our church. At the same time, we hope and expect more advocacy in some concrete cases such as the Cremisan valley issue where 58 Christian families will lose their precious land because of the determination of the Israelis to enlarge the two settlements of Gilo and Har Gilo. Since the decision of the court was motivated by political factors and not legal ones, the self-defense should then be through advocacy and political pressure. In this regard, we believe the Holy See can do a lot.